Some Guilbert and Betelle schools have unusual features. 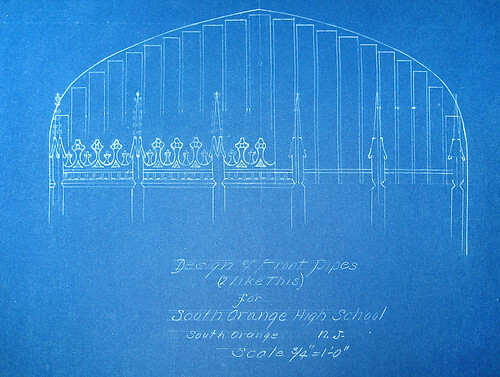 We’ve seen the greenhouses, the swimming pools, the observatories, and even the airplane shops… but in terms of sheer lavish expenditure in a public high school, it’s pretty hard to beat a pipe organ. Mark Zuckerberg, the 26-year-old founder and chief executive of Facebook Inc., plans to announce a donation of up to $100 million to the Newark schools this week, in a bold bid to improve one of the country’s worst performing public school systems. Potentially to be matched by funds raised by Mayor Cory Booker. I’d be interested to see if any of the funds will go to upkeep, renovation and/or restoration of Newark’s classic Guilbert & Betelle schools. Over the past few months, I’ve been getting letters from readers about an abandoned school in Garden City, Long Island, called St. Paul’s, on the verge of being demolished. Last Friday, I hopped the train with my bike and camera to have a look for myself. This amazing 1879 Victorian pile—apparently in fine condition—is likely to be razed for no pressing reason. The article dismantles the logic of the demolition with stinging wit. Another great one from SNY. Ten beautifully restored chandeliers were recently installed in the auditorium at the Washington Irving Intermediate School of Tarrytown, New York. The school recently underwent a major renovation which included larger classrooms, an expanded library, a new art room, renovated music rooms, a new nurses station and renovations of the existing offices. A wonderful restoration job from 2009. 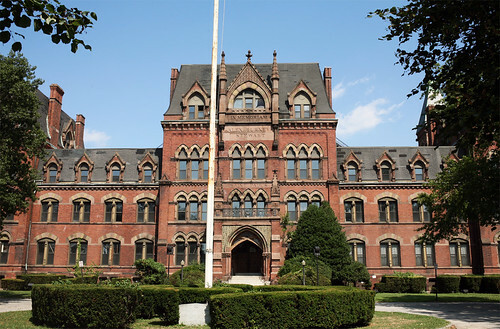 The article does makes a few errors; the Washington Irving school isn’t in “Betelle’s signature collegiate-gothic style”, but rather Georgian, and Guilbert & Betelle was located in Newark, NJ, of course, not NYC at that time (I know, I can’t help nitpick).